X-Men: Dark Phoenix was never going to be all rainbow and lollipops. As these new images attest, this looks to be the darkest chapter in the franchise – and I’m including Logan in that, which was about as light-hearted as getting a shave from Wolverine himself. There’s a funeral, dramatic staring into the distance, and Jessica Chastain’s villain gets a name too. Neat. Let’s start off with the funeral. It’s not definitely a funeral, but I can’t think of many other reasons why you’d stand around in the rain in black suits whilst holding an umbrella. Professor Xavier, Nightcrawler, Storm, and Cyclops are all present. The main missing trio who aren’t there and may have bitten the bullet: Jean Grey, Beast, and Mystique. Take your pick. Two of those three, however, are present in the other images. Jennifer Lawrence is donning the blue makeup yet again and she’s looking pretty perturbed. That’s nothing on Sophie Turner’s Jean Grey, though, who turns the angst up to 11 by being all down in the dumps in the middle of a downpour. Has she just slain one of the X-Men as she did in the comics? The final image is the most intriguing, however. 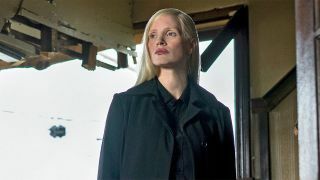 Jessica Chastain’s previously unnamed villain has been revealed by IGN to be called ‘Smith’. That’s probably a cover-up for a comic book character, such as how MJ was ‘Michelle’ in Spider-Man: Homecoming. There is a little-known mutant from the comics called Tabitha Smith, but she’s firmly on the side of good, not evil.